Lifespan: 100,000 hours(~ 10yrs) Low energy conumption. Made for outdoor usuage 1 or 2 line messages Adjustable speed. Signs are UL Listed. UL Standards were made in place to make sure that the products are safe and able to withstand specific conditions (Fire testing, Electrical testing). 1 year Parts/3 Year Factory Labor Warranty. Hanging Wires included with the remote control and manual to program the sign. Beware of fake listings. We have no authorized re-sellers on Amazon. Should you see our product sold, by anyone other than mega-sign-inc, it is not our product and will not have our warranty. If you have any questions about this product by MegaSignInc, contact us by completing and submitting the form below. If you are looking for a specif part number, please include it with your message. 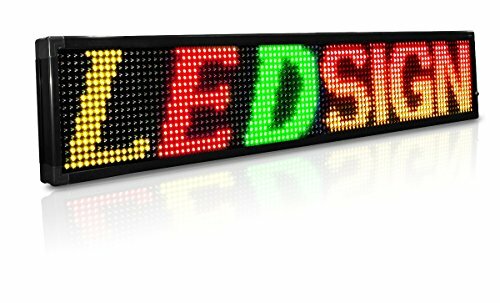 OLIVE LED Sign 3Color, RBP, P20, 15"x53" IR Programmable Scrolling Outdoor Message Display Signs EMC - Industrial Grade Business Ad machine.